Above: A farmer in the distance is seen, silhouetted while working, through a train window. The stark emptiness of the image is what makes the person seem so prominent. Cool colors, green and grey-blue, create a relaxed and open landscape that contrasts the farmer’s firm form. Above: Color and form first attracted me to the setting below the Eiffel Tower, then a fellow photographer in a too-see-through dress added some unique content. The post title says it all – street photography from beautiful Paris. I really like how all the elements form an abstract nature: water jets slice through the frame, a young girl apparently in the path of large sliding figure, and the flat perspective give the viewer leeway in interpreting the image. Statues, sprinklers and fun in the sun. July 9, 2013. Cigarettes and coffee play an important role in French culture. Intently writing and smoking in a Paris cafe. Sometimes a subject catches you taking the photograph. That happened when a lady standing in lovely light with great hair saw me snap my shutter. Perhaps my favorite element in the image is the suitcase-pulling pedestrian in distance. Getting the glare, July 8 2013, Paris. I’ve been blogging about travels in Europe last summer – since my objective is to go mostly chronological this is one of my last posts from Paris, save film shots or missed images. This is also my last post from Notre Dame Cathedral. Today we travel inside. With anything so grandeur it’s impossible to capture to the feeling of being there. Indeed that could be said for any photograph. The main altar front, complete with floor cleaning. Notre dame has many altars, the following photo is one of the side altars. Side altar, Notre Dame Cathedral, July 10, 2013. Photographing inside Notre Dame Cathedral does require a somewhat advanced digital camera. The lack of light means shooting at ISO 1600 minimum. New years eve: Alaska Satellite Facility tracking aperture and fireworks. A satellite-receiving dish is seen as fireworks celebrate the end of 2012 and the start of 2013 on the ski trails at University of Alaska Fairbanks. Known also as a tracking aperture, the 11-meter dish is part of the Alaska Satellite Facility (ASF) of the Geophysical Institute’s Satellite Tracking Ground Station (STGS). The 11-meter X- and S-Band system, along with a smaller 10-meter dish, are just one appendage of a world-wide Near Earth Network, run by the National Aeronautics and Space Administration (NASA). The high latitude of ASF’s ground station allows for 11 connections per day with polar-orbiting spacecraft, ASF then downlinks, processes and distributes data. I tried to correct the color of the tracking aperture, which had a yellow caste due to artificial lighting, while maintaining true hues of the fireworks. To accomplish this I set my white balance on the dish, lightened the shadows and slightly saturated the image. What made the biggest difference was a slight curve, increasing the highlights and decreasing the shadows, of the red and green spectrums. The end result, I feel is very close to what would have been seen. My ISO was 125 and tripod shooting was essential, and exposure times were 10 to 15 seconds. Weekly Photo Challenge: Big. Big splash at the Sikuliaq Launch. How great the image I was about to post fits perfects with the photo challenge this week. 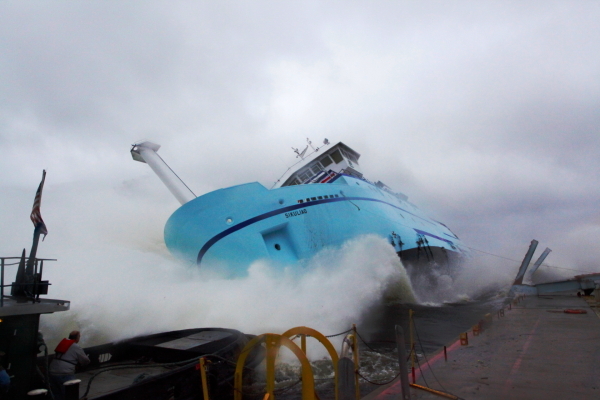 Last saturday the 261-foot Sikuliaq launched into the Menominee River from Marinette Marine Corporation, Wis. The National Science Foundation owned and UAF operated vessel entered the water at a steep, 60-degree angle. It created quite a splash. Unfortunately the cloudy sky that deposited rain all day long makes it difficult to truly appreciate the size of the wave. The person on the tug boat in the lower left corner offers some perspective. Stay tuned for more Sikuliaq coverage. Knowing it would happen fast and be unpredictable I went with a wide-angle lens and a high, 3200 ISO so I could use a quick shutter speed. Here’s a Daily News-Miner article covering the christening and launch ceremony, as well as some science capabilities and the future journey of the Sikuliaq, co-written with my advisor Lynne Lott. Research Vessel Sikuliaq gets its first taste of the water, Marinette, Wis. 25mm at f13, 1/1000 sec. Wildflowers are a main attraction to be found on Mt. Rainier. There are obviously many others: great views, unique structures, waterfalls, glaciers and abundant wildlife. I will feature them all in the weeks to come. But it’s Friday, so let us relax, enjoy the beautiful fall and maybe daydream a little. 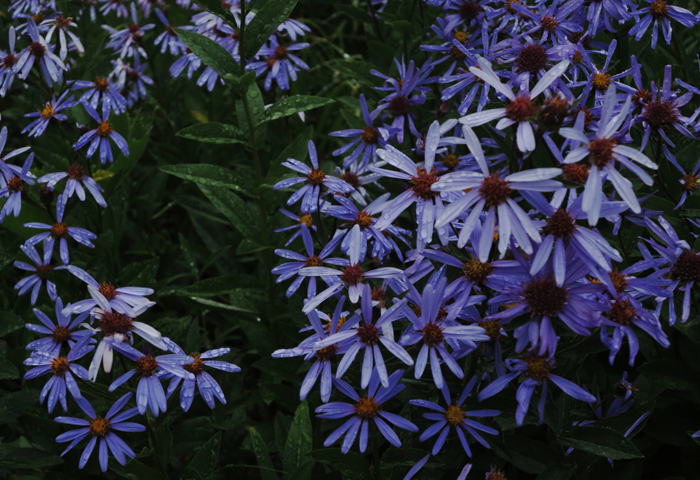 To facilitate those feelings take a look at the pretty purple flowers.